I say cross-polarization and people ask me about bees and plants, its polarization not pollination! Yet, I do miss those bees and the flowers shots, I must go hunting soon! This week’s experiment is in cross-polarization. If you’ve even wore polarized sunglasses (and I haven’t because I wear spectacles already), you might have seen strange patterns on car windshields, the polarised sunglasses are revealing areas of the glass that was put under stress during the manufacturing process, the patterns resulting when using the polarised sunglasses are a phenomenon known as “birefringence”. The important part of all this is that the results have a very cool effect when combining a polarised filter on the camera with a polarised light source through a transparent material that has gone through a stress-related manufacturing process. Just for experimentation, I’ve used a transparent plastic ruler. I always love looking at the interesting patterns which show up in some windshields through my polarized sunglasses, I never knew there was a name for it. There really is something interesting to learn every day, thanks for that. The experimentation is pretty cool too. I used to do a lot more of this type of thing. You are encouraging me to get experimenting again. Cool…. I like this… I wonder where else you can take it though… Eagerly awaiting the next instalment! Thanks Nigel, I know this is something you would love to try and even better it! How cool is this, I never heard or seen of this in photography. It’s so neat to see your experiment and learn from it. Thanks for sharing. 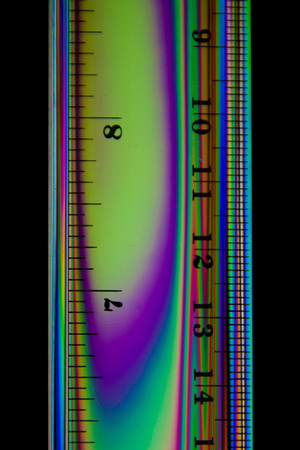 This is a nice project Mike and thank you for the info about birefringence. I do not wear polarized sunglasses but I would like to take a look at my “new” windshield through some and see what I see. Keep up the experiment and I look forward to more photos. really neat Michael! always wondered if that had a name… you certainly are a visual explorer!